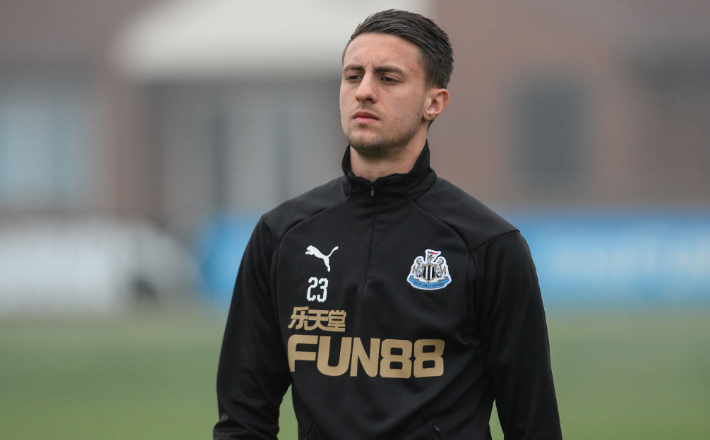 Antonio Barreca hits out at the club on social media – He’s not happy at all.. – NUFC blog – Newcastle United blog – NUFC Fixtures, News and Forum. 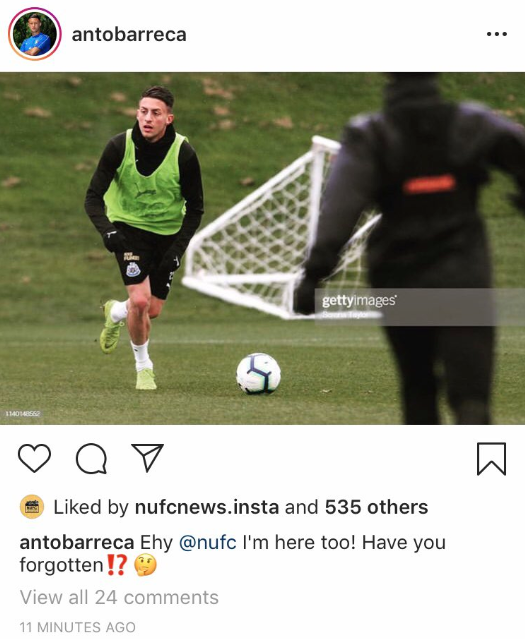 Antonio Barreca hits out at the club on social media – He’s not happy at all..
Newcastle loanee Antonio Barreca has hit out at the club on social media, stating ‘Hey @NUFC, I’m here too! Have your forgotten? !’ during his latest post on Instagram. While it was quickly made clear that the Italian was brought in to provide Benitez with cover at left-back – and not come straight in as a starter – it’s easy to see why he’s not happy. After all, following his deadline day loan move from Monaco he’s played just 4 minutes in our 1-0 at Spurs and failed to even make the bench in our other 7 games that have followed. Here’s what he’s posted on social media this afternoon as a result, signalling to the club that he’s far from happy. While it is important to have cover in all areas, even a certain Mike Ashley may be wondering just why Barreca was brought in. Yes we lack depth in the left back role, but with Ritchie filling in well and Kenedy and Manquillo being able to operate in that role as wing-backs, it does seem one of the more pointless signings in recent history – especially when he can’t even make the bench. He’s not happy and, in a way, I don’t blame him. He may not have been Rafa’s top target in January, but to say he’s been left out in the cold is an understatement. Ridiculous new Salomon Rondon claims emerge – This has Mike Ashley written all over it.. Certainly couldn’t be any worse than ‘the Dummy’ currently holding down the left back position. Can’t be any worse than The Dummy currently holding down the left back position. He wasn’t even playing for his own club. Another ridiculous loan move by Charnley. Didnt even say that, it’s not the real picture. It was – he’s edited it since..
Dummett is no world beater but that’s very harsh on him mate.. I for one feel for him. Only weeks ago the the club was moaning at the lack of football for our loanees and recalled them. I’m sorry but you can’t have your cake and eat it. Give the lad a chance. If he isn’t on par or better than we already have we shouldn’t of brought him in.